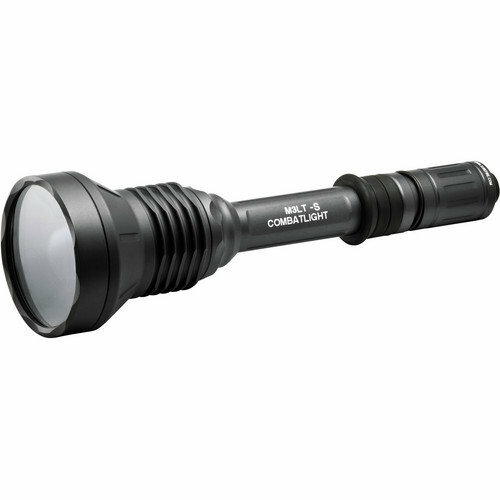 The M3LT Combatlight 9V Dual Stage 100/1000 Lumens Strobe combines a 2.50" diameter Turbohead, a Total Internal Reflection (TIR) lens, and an high-output LED emitter. It produces a focused beam suitable for spotlight/searchlight applications, yet the light is less than 9 inches long. The M3LT-S-B includes a high-output strobe mode for special tactical applications or for signaling purposes. The strobe is activated by pressing the tailcap switch rapidly three times. The LED is durable since there is no filament to burn out or break, and it provides a longer runtime per set of batteries when compared to incandescent lights of similar lumen output. It comes standard with an aerospace aluminum body with a Mil-Spec hard-anodized finish for extreme durability. Also features an ergonomic CombatGrip configuration suited for flashlight/handgun techniques and provides a secure hold with cold, wet, or gloved hands. The M3LT features tactical switching; a tailcap-button for fast, no-look access and for use with flashlight/handgun techniques. The tailcap button always activates maximum light output when fully depressed.